Tagged under Kou Fumizuki, J.C. Staff, Series. The anime adaptation of Fumizuki Kou's manga features Kaoru Hanabishi, a normal every day college student. For years, he lived independently and alone. One day, his entire life gets turned upside down. He meets a young woman about his age one day at the train station. She appears lost and is searching for someone. In kindness, Kaoru lends a hand, without knowing that he was who she was searching for. Aoi Sakuraba is the only daughter of a wealthy family. As such, her hand is well sought after. Unfortunately for her family, she already has her heart set on Kaoru, her betrothed. As a gesture of good faith, her parents allow them to live on the same property, with her acting as the landlady and her caretaker as the owner. Poor Kaoru has been reduced to playing the part of a tenant. How will Aoi and Kaoru explore their love with so many distractions? Will Aoi be able to cope with the number of love rivals? If you like hare-anime, you're going to enjoy it, but if you don't...well give this a try, because it's a bit more serious, than most of them. Throughout the filler episodes we will get very much humor. It's the best watched together with your friends! One good point is it's rewatchability. I've already seen it 3 times. Got both series recently at a good price, but had seen for some time before. As with most of this generation of harem titles, I really wish they'd get to the ending (I couldn't care less about the more modern ones, for several reasons). Great: Those two have to be the cutest anime couple alive. The series wound up having that 'harem' stuff go on, but I liked that they didn't go way over the top with it, and kept it a more 'natural' way. It was enjoyable to watch a couple that didn't know each other but due to circumstances were to be married, grow to actually actually get to know and like each other. It's not always smooth sailing but, with a lot of friend support and communication things seem to work out. relationships rather well presented but falls into the category of one male several female surrounding scenes. suppose anime is to fullfil things that you don't get in reality. hence, the main female lead being portraited as dedicated all her life to the main male lead. found the male lead pretty selfish vs. female lead. 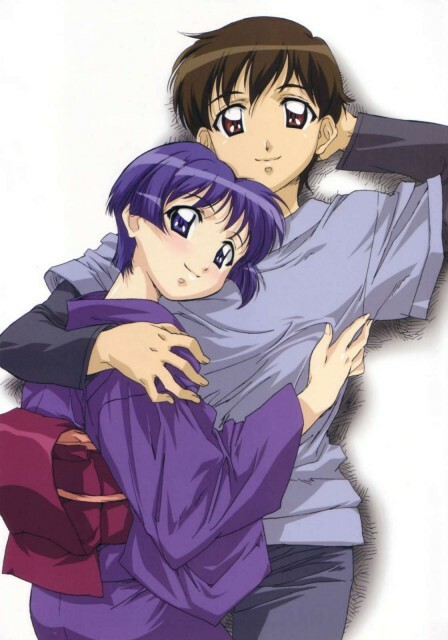 Ai Yori Aoshi is a very adorable series that I enjoyed watching. This is another series that can actually happen in real life. That's why I enjoyed it. It has romance, drama moments, a lot of comedy into it, and it even has a triangle. But it ended the way I wanted. The reason I gave it a 8.75 is because I was at least expecting a little more from the main characters, what they did in the series was good - but I wanted to see more echiness - <.< That's just me though. Overall the series was cute. A solid story with amazing and wonderful characters. It gets into more of a romantic comedy then I would say a shojo title where that is mostly romance. It also has a lot of fan service with is always a plus in my book. I was pleasantly surprised when I watched this Anime. It turned out to be a lot better than I expected. The characters were all enjoyable and the story was really cute. The ending left me wanting more, but I suppose that's not really a bad thing. Just wish Enishi was longer than it was.